The XL filament spool contains a larger amount of filament than the standard spools. They will allow you to create many 3D prints, without having to worry about changing the spool. 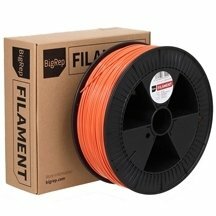 With the large filaments spools, the risk of lacking filament during printing is considerably reduced. The use of larger filament spools will allow you to simplify your 3D printing: the spool change is less frequent and your filament is less likely to get tangled. XL filament spools are perfect for your large-format 3D printing needs. Therefore, you no longer need to store a large number of spools containing the same filament but only store one which is heavier. The XL filament spools able you to print large parts without changing the filament during printing. For 3D printers that can print large volumes, large spools contain a standard filament diameter of 1.75mm or 2.85mm and fit very well with most 3D printers on the market.